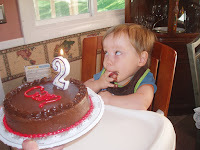 Happy 2nd Birthday to Cameron on Monday! Grandma ordered the coolest cake with real matchbox racecars. The cake was incredibly yummy and Cam had fun with his cousins, aunts and uncles. The big boy received some awesome birthday gifts... the Schulze family gave him a "digger" which Cameron promptly decided he wasn't too keen on sharing... he definitely scooped it up when Annie tried to take a closer peek. Also, some of his favorite cousins- Mike/Kevin and Eric gave him a HUGE Tonka dump truck that will be lots of fun on the beach. It is literally almost as big as Cameron. More cousins- the lovely Haroldson family gave Cam some great new books and the Trucks one is read the most! Grandma and Grandpa picked out a Little People airplane set, since Cam loves to travel on the plane as well as more new books. Cameron's second family, the Ringlers dropped off the cozy coupe- a ride-on scooter that doubles as a walker! And Mom & Dad had him open some new puzzles, books and bubbles. 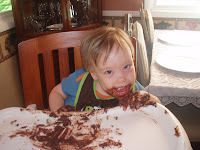 As shown, the birthday boy had a little cake all to himself that he quite happily dug into with both hands! 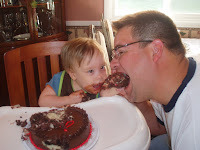 How sweet that he even gave his Dad a little taste. After all of that fun, Cameron had a great time getting all clean in the bathtub, especially with all that frosting all over his face! Surprisingly enough, Cam was pretty wide awake that evening and didn't go to sleep until almost 11pm- can you say... a little bit too much sugar?! But, since his birthday is only once a year, it's well worth it!